In the morning, we visited a local bakery for breakfast. We couldn't find any fast food, but we later discovered there's a McDonalds near 6th and Main. 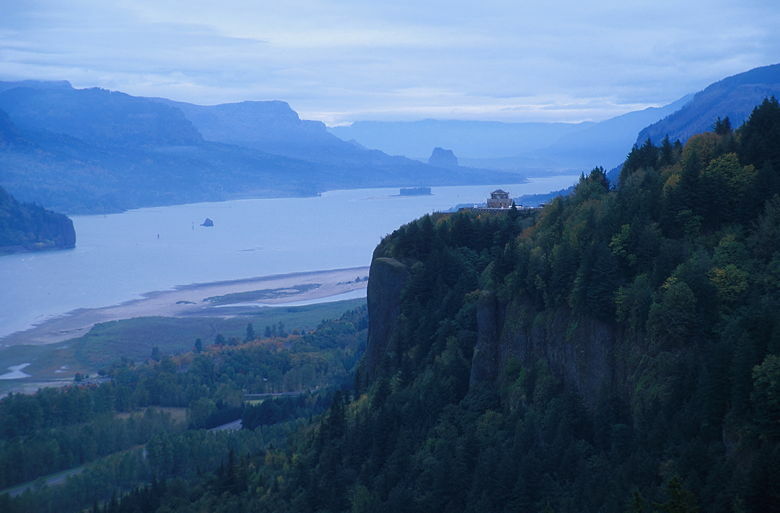 In any case, we ate our breakfast and then headed east on Highway 84 toward the Columbia River Gorge. We took the historic highway, stopping at one viewpoint before coming to Crown Point. The structure here was undergoing renovation at the time, so we couldn't actually enter it. We had to take in the view from outside. The overcast sky muted the patches of fall color below. There were some reds, but mostly yellows; the colors were mostly pre-peak, unfortunately. Another week or two probably would have been better. We continued along the highway and parked at the Horsetail Falls parking area. Then we started off on a hike to Triple Falls. After the hike we continued along 84, crossing the Columbia on the Bridge of the Gods. We drove along the Washington side of the gorge on the way back, stopping briefly to visit a Pendleton store (blankets, knit sweaters, etc.). We had reservations at some fancy restaurant, but we were hungry and wanted something quicker, so we stopped at Portland Chinatown and ate at one of the restaurants there -- in fact, it happened to be next door to the one we'd eaten at on our trip a year and a half earlier. Which isn't so coincidental when you realize that Portland Chinatown consists of about 4 blocks. After dinner we returned to the hotel. Another advantage to staying at the Heathman: you can watch movies for free from their library of over 400 movies.